2 PACK Fountain/Pond Protector 16 oz. | Fountain City Art Ctr. 2 PACK Fountain/Pond Protector 16 oz. 2 PACK Fountain/Pond Protector 16 oz. by Care Free Enzymes at Fountain City Art Ctr.. Hurry! Limited time offer. Offer valid only while supplies last. Topical concentrate to take away water surface tension. Water tension allows mosquitoes to land on water surface where they drink and deposit larvae. Topical concentrate to take away water surface tension. Water tension allows mosquitoes to land on water surface where they drink and deposit larvae. Without water tension, mosquitoes at all stages will sink and drown. Non-Toxic. 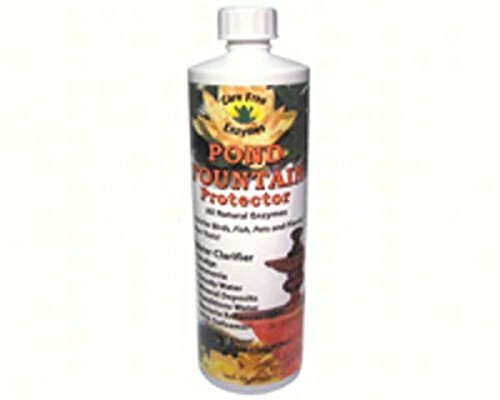 Pond and Fountain protector is a 16 oz bottle. Cap-full will treat 100 gallons of water. All contaminates are dissolved as Pond Protector is designed to leave a protective barrier which does not allow for mineral deposits to adhere. If you have any questions about this product by Care Free Enzymes, contact us by completing and submitting the form below. If you are looking for a specif part number, please include it with your message.